Want to improve your race performance by 1 to 3 percent but invest very little time, effort and money? That sounds like a gimmick on an infomercial. And 1 to 3 percent isn’t really a whole lot– or is it? If you are a male 30-34 Ironman athlete competing at the 2014 world championships that actually amounts to quite a bit. Let’s say you’re the 10th place finisher in that age division. A 1 percent gain would take you from 10th to 4th place; a 2 percent gain would put you on the podium in the number two spot; a 3 percent gain would put you on the top step of that age-group podium. Not only would your race results be better but your overall enjoyment of the race may be enhanced as well. Now that your interest is piqued you are perhaps wondering how much money and time you would actually have to invest to achieve these gains. What would you say if I told you it was only a few minutes per week and could cost as little as $20.00 for your entire season of training and racing? Ready to buy? All right then – run or bike down to the grocery store and pick up some generic sodium bicarbonate in the baking aisle – it’s in that iconic yellow box labeled baking soda. 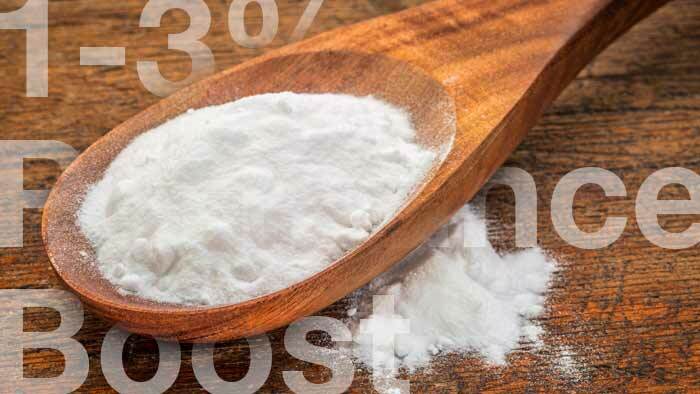 Let’s take an in-depth look at exactly what sodium bicarbonate is and how it works with our physiology to enhance training and racing performance. Sodium bicarbonate is an alkaline salt. Alkaline means it is a substance that possesses a pH (see below) on the basic side (8.4 to be exact where 7.0 is neutral). A salt is a chemical compound which has a hydrogen ion replaced by cation, which in this case is sodium. The chemical nomenclature for baking soda is NaHCO3. Sodium bicarbonate acts to buffer acids produced by the body during physical exertion. One of these acids is well known to us as lactic acid and another less familiar one is carbonic acid. -log10 c, where c is the hydrogen ion concentration in moles per liter. More simply put, the concentration of hydrogen ions in your blood (and body tissues) is inversely proportional to the numerical pH value. For example, if your pH is low then your hydrogen ion concentration is high and conversely, if your pH is high then your hydrogen ion concentration is low. So, more hydrogen ions equals more acidity. Human beings function optimally at a relatively alkaline (or basic) pH. The average pH of our blood is between 7.35-7.45. The normal, if not optimal functioning of every system in our body is dependent upon the pH being in this range. Normalcy of pH also regulates electrolyte concentrations and that will be discussed in part 2 of this article series. Our kidneys produce sodium bicarbonate constantly to keep our pH level in this very tight range of 7.35-7.45. As athletes, we produce two main types of acid. The first of these is lactic acid which is a bi-product of anaerobic glycolysis. Anaerobic glycolysis is the breakdown of glucose without the benefit of oxygen to enhance the process. This occurs when we have exceeded a level of exertion that allows our body’s cardiorespiratory systems to provide adequate oxygen to our working muscle cells. The second form of acid is carbonic acid. Hard working cells produce carbon dioxide. Carbon dioxide combines with water (H2O) to form carbonic acid (H2CO3). Both of these acids serve to lower our blood pH levels resulting in a relative acidosis that cause our intracellular machinery to falter and fail. Our muscle cell mitochondria are exquisitely sensitive to lowering of blood pH. Theoretically, supplementation with sodium bicarbonate should delay the onset of fatigue and ultimately muscular (skeletal and cardiac) “failure” by assisting the body in maintaining a normal pH during high intensity exertion. Delaying onset of intracellular acidosis during exercise assists in maintaining a more homeostatic cellular environment that allows for optimal functioning and performance. Sodium bicarbonate as an ergogenic aid has been studied extensively over the past 60 years. It is a challenging topic of investigation because so many other variables are at play in the final determination of athletic performance, and none of these can be completely controlled for. However, in a study that applied a meta-analytic technique to the results of 29 of the best-conducted studies on the topic, the statistical comparison of these scientific inquiries indicates that not only does sodium bicarbonate enhance athletic performance, it improves exercise time to exhaustion by a mean of 27 percent. In part two of this series we will examine timing and dosing of sodium bicarbonate in racing and training, available commercial formulations, potential positive psychological effects of use, as well as some of the potential negative side effects.